Sliding glass patio doors are ideal for locations with limited floor space or furniture nearby. Milgard sliding glass patio doors are crafted for smooth operation and beautiful design. Standard sliding patio doors open by sliding along horizontal tracks at the head and sill. They can be designed for either a right-hand or left-hand operation. While hinged doors open inward or outward, sliding patio doors do not require swing room and can accommodate tight-fitted spaces. 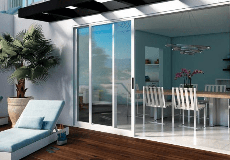 Explore Milgard sliding patio doors by product line or frame material below. A beautiful, premium sliding vinyl patio door with a traditional and elegant look. A contemporary sliding vinyl patio door with a frame profile so narrow, you’ll hardly know it’s there. Satisfy your desire for a clean design with Style Line® Series slim-profile frames. French-style sliding patio doors with a beautiful wood interior and a fiberglass exterior for a combination of beauty and performance. A is a stunning, high performance, fiberglass French-style patio door that can help you create the home of your dreams. A light and thin sliding patio door with the hallmark of aluminum durability. Getting ready to buy new patio doors? From frame style to glass options and how to plan to use your patio door, there’s a lot to consider. With so many choices, we’ve created a quick guide that can help identify key points you’ll want to keep in mind before you shop for patio doors.